South of the border, eating spicy Spanish food paired with a tangy margarita? If you want your guests to relax in a festive fiesta atmosphere at your next party the you'll want to create the ideal Spanish like party with the help of our variety of fiesta accessories. Host a fiesta at your home or office with our large selection of fiesta decorations and supplies. 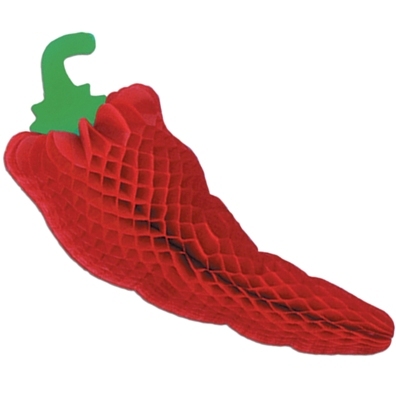 Our large selection of chili pepper party accessories will make sure your party is hot! Make sure everyone knows about your party by sending out fiesta and Mexican party invitations. Spice up your food service with chili pepper food picks and chili pepper drink stirrers. For a true Mexican activity, our Bull Pinata will be a party starter for all of your guest. Once the party is started place a Chilli Pepper Margarita Glass in their hand filled with their favorite margarita drink. These Fiesta Accessories are very inexpensive so you can have more money to buy margarita supplies and more food! Make sure everyone knows about your party by sending out fiesta and Mexican party invitations. You can start by decorating your home or back yard with our colorful fiesta decorations. But don't pass up any of our accessories. If your planning your fiesta party out back our fiesta string lights would look great hanging from the back of your house or along your porch. We have an Inflatable Cactus and balloon cactus and a colorful burro pinata. We also offer a variety of sombreros, fiesta fanci-frames and mustaches you can pass out at the start of the party as favors. Spice up your food service with chili pepper food picks and chili pepper drink stirrers. If your having a bar or planning to serve margaritas we have neon margarita glasses as well as Mini Margarita Shot Glasses. Don't throw another boring party, browse through our wide selection of fiesta products and make your party feel like your spending the day in Mexico! Did you know that chili peppers originated in the Americas? Chili peppers were heavily used as a trade item with the early settlers from Europe because they didn't have anything like them and the chili pepper was just the thing to kick up their culinary taste buds. Columbus brought back chili peppers from Mexico to Spain and this explains why Spanish food in many ways in similar to Mexican food, but when it comes to serious hotness, Mexican food is king. The influences of Mexican chili peppers in cooking poured into the United States and are used heavily in Tex-Mex cooking and of course, Chili cook-offs. So make sure that you incorporate the pepper into your decorations. With the Chilli Pepper Balloon on each table and hung around your party venue.